I had mixed feelings when it came to the ‘working’ part of my Australian Working Holiday. After a few months of travelling down the East Coast of Australia, I was ready to work again, both mentally and financially. However I felt overwhelmed by the prospect of actually looking for work and I knew that once I had a job, the constant daily excitement that I had gotten used to in my travels would decrease- work is work after all. I arrived in Melbourne with less than two weeks until christmas and was pretty resigned to the fact that I would not be able to find a job until the new year. However after a couple of days of making phone calls and handing out CVs, I’d managed to get a barista job and a paid marketing internship secured. Now after a few weeks, I’m fairly settled and I thought it was a good time to write a more insightful post about what it’s like to work abroad in Australia. I know to a lot of people, a year abroad in Australia sounds like the dream. However you’ll be surprised at the number of people who cut their trip short. When it comes down to it, the ‘working’ part of the trip is often a bit of a reality check for some people: the fun part is over (in some senses) and the hard bit begins. You don’t really hear about the travellers that didn’t really feel at home in Australia, however I have met plenty. Trying to find work in a new country presents a struggle and it can be really stressful, particularly if english is not your first language. When it comes down to it, a lot of travellers would rather go back to their jobs at home, where they have their friends and family around which is totally understandable- just make sure you know what you want before you come here. You only get one working holiday and it costs a lot of money. If you’re in any doubt then why not get a tourist visa first? It’s valid for three months and it’s a great way to test the water out first. I’ve spent a lot of time backpacking over the last couple of years so I’m used to being fairly independent however the working holiday is entirely different. In the UK I live at home and have my friends and family around. In Melbourne I’m on my own. I have to sort things out myself, get myself around the city, pay my rent, cook my own food and meet new people. It’s exciting and there’s always new people around to do things with, plus I’m preoccupied with a whole city to explore. Coming to Australia has given me a taste of real independence and if I can set up a life on the other side of the world, then I can do it anywhere. Working in Australia has been some of the most physically demanding work that I have done. In order to save up some money after paying rent, it’s hard to say no to shifts and considering that I am currently doing two jobs, I’m working most days. Unlike at home where I can go home and switch off, while I’m waiting to move into my shared apartment next week, I’m still in a hostel. This means that every evening after work (and each morning before) there are new people to talk to and there’s always something going on. Going out for endless cocktails seems like a good idea in the moment but it’s not so great when you have to be up for an eight-hour shift the next day. Seven Eleven coffee is a necessity. I have so many moments where I am so hyped to be working in Australia. Melbourne is my dream city and everyday I am proud of myself for settling in here and finding work. However not everyday is exciting. Some days I’ll just wake up, go to work and go to bed. It’s not because I’m depressed or I’m bored with Melbourne (anything but) but it’s because I know I have the time, and it would be physically impossible to do something significant every day for the next few months. Staying in a hostel while I have been settling in to Melbourne has its benefits and downsides. The plus side is that hostels are sociable so they are a good place to meet people who you can do things with. The downside is that people are always coming and going so it has been so sad having to say goodbye to people who I had gotten really close with. The cafe job that I have here is one of the hardest hospitality jobs that I’ve ever had but the customers are some of the nicest. What’s best is that I can’t count the number of times that I get compliments from locals on my english accent; compliments just for talking! Plus my accent is a great conversation starter with all of the travellers and locals who come into the cafe. There’s always an interesting story, or two to hear. The wages are fantastic in Australia, almost twice as much as at home in the UK actually, However saving up is harder than I had anticipated. At the moment I am staying in a hostel. This means that I am paying a crazy amount on rent, and because there’s always a lot going on, I’m also spending a lot of money on socializing. While soon I am moving in to a shared apartment and will undoubtedly start saving some money, at the moment it’s hard to save up my wages specially compared to at home where I am living rent free and with free food. I’m not here to make lot of money though. As long as my income meets my outgoing I’m pretty happy- it is a working holiday after all, not either/or. I hope that this post have given you some insight into what it’s like to work on a Working Holiday in Australia. I’m currently living my dream life in Melbourne. Yes some days are hard and sometimes I even question what I’m doing here but overwhelmingly I really love it here. I’m getting all of my creativity nurtured through my marketing and content writing internship (along with the experience of being in a modern city centre office with free food and Kombucha on tap!) Then I have the physical challenge and experience of making coffees and waitressing in a cafe, in a city known for its coffee culture. At the moment I’m just taking advantage of having a hot January where days off can be spent at the beach, eating gelato by the river and going out in a vest top in the evenings. Even though I’m working, I’m still a traveller, I’ve just taken a little pit stop for a while. 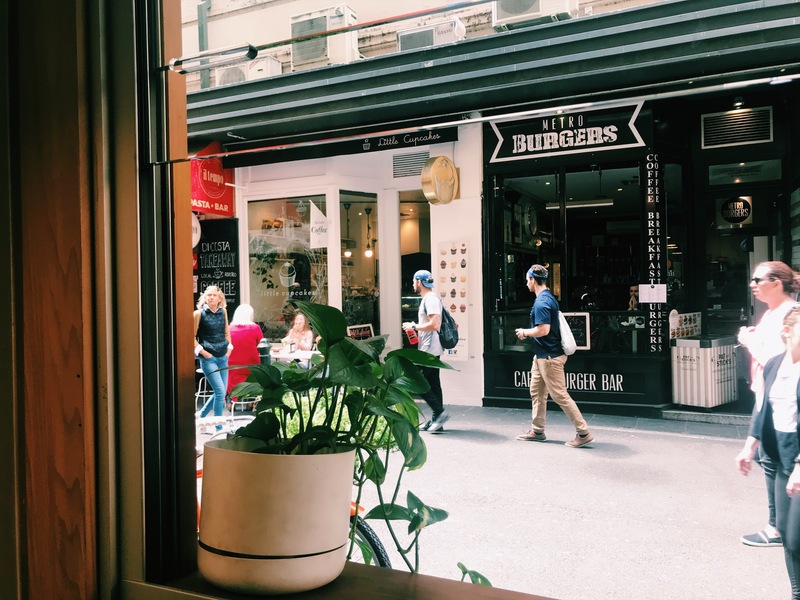 In Melbourne, for the first time in my travels I am in a new country and I don’t have to look for local recommendations in the area; I am compiling a great list of my very own. You can read more about my work and travels in Australia here.